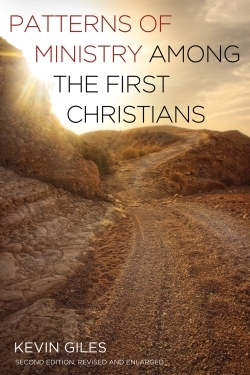 In this second edition of Patterns of Ministry among the First Christians, Kevin Giles states that his primary goal is to provide a detailed study of the historical development and characteristics of Christian leadership that is accessible to a wide range of readers (viii). Accordingly, Giles avoids technical language that might hinder non-specialists. Additions to the 1991 edition include multiple digressions which will be of interest to readers of Priscilla Papers, as well as a closing chapter devoted to ordination. While Giles provides a general discussion of church leadership, this review will focus primarily on his comments concerning women and their leadership activities. Giles begins the book by outlining some of his own presuppositions and primary sources. In ch. 2, he carefully examines Jesus’s instructions concerning the type of leadership that should be present among his followers, as well as Jesus’s own example and interactions. Giles notes Jesus’s interaction with and esteem for women throughout his earthly ministry, exemplified by his conversation with the Samaritan woman of John 4 (22). Following ch. 2 is an excursus entitled “Jesus and Women” (26–32). Giles expands his discussion of Jesus’s interactions with women, especially noting that Jesus had female disciples (unlike Jewish rabbis). He also observes that Jesus’s teaching on marriage and divorce was especially radical in his social context, pointing his hearers toward the original ideal of equality between men and women (27–28). Giles goes on to point out four especially pertinent examples of Jesus’s positive interactions with women, including the woman who spoke from the crowd in Luke 11, the Samaritan woman of John 4, Mary and Martha, and the woman who anointed Jesus in Mark 14 (28–30). In ch. 3, Giles shifts his attention to Paul and what his letters tell us about early Christian leadership. This chapter contains an excursus on women leaders in Paul’s early and undisputed letters (41–50). Giles focuses predominately on the women who are listed among Paul’s coworkers in Rom 16, including Phoebe, Priscilla, Junia, and others. He carefully examines the case of Junia the apostle and responds to the various arguments made by those who attempt to rob her of her apostleship (45–46). Chapters 4 and 5 concern bishops and deacons, respectively. Based on the conclusion that the earliest bishops were leaders of house churches, Giles argues that we must conclude that women were bishops in the early churches (63–64). He discusses various women who appear to be leaders of such house churches, including Lydia, Chloe, and Phoebe. In ch. 5, Giles claims that the women referenced in 1 Tim 3:11 are themselves deacons. He also notes post-biblical references to female deacons as early as the second century AD and throughout the fourth through sixth centuries AD (86, 91). In ch. 6, which centers on elders, Giles briefly states that several early Christian writings mention women elders and some even forbid them, indicating that female elders were indeed a reality in the early church (117). Giles turns his attention to apostleship in ch. 7, first making the case that the term “apostle” does not refer exclusively to the original twelve apostles. After establishing and defending this interpretation, he argues for female apostleship based on the understanding of an “apostle” as “one who is sent” (139–40). This chapter concludes with an excursus containing seven responses to the argument that only men could be apostles because the Twelve were male (145–48). Giles ends this digression with the humorous comment that if this logic is followed, then, in light of the men appointed to care for the Hellenistic widows in Acts 6, perhaps only men should be allowed to work in church kitchens (148). In ch. 8, which focuses upon prophecy, Giles offers a brief discussion of the various prophetesses in the OT and their actions (153). Moving to the NT, he comments that while 1 Cor 11 is exegetically perplexing, it does assume that both men and women participated in prophecy in the Corinthian church (161). Chapter 9 offers an overview of teachers in the early church, stating that, based on the NT, women were clearly involved in teaching (186–87). He draws on the examples of the Samaritan woman of John 4 and Priscilla, and also claims that the prohibition of women teaching in 1 Tim 2:12 implies that they were previously free to do so (187). Of final interest to readers of Priscilla Papers, Giles includes an excursus on 1 Tim 2:12. He begins by noting the dangers of crafting theology around a single text, then provides a summary of three competing interpretations of this passage (195–206). He concludes by offering several supporting points for the egalitarian interpretation, which understands this text as a response to a specific and exceptional situation in Ephesus (207–14). In this book, Giles offers a thorough and practical analysis of early church leadership, especially regarding women’s participation. While readers may notice a number of typographical errors, these mistakes do not diminish the substance of this helpful work. Giles provides an accessible and easily understandable study of this important topic from an egalitarian perspective.